Located near the Bellarine Peninsula, Victoria. Close to the entry of one of the worlds great coastal drives, the Great Ocean Road. 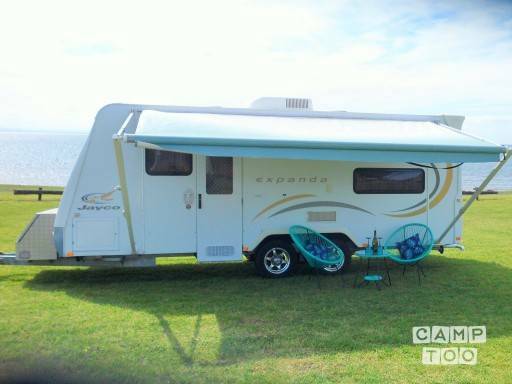 Offering a Queen sized bed and two bunks, this caravan sleeps 4 people comfortably. This layout makes it perfect for couples and small families. Immaculately presented with all the basic facilities, such as linen (pillows included), cutlery & crockery, keeping you comfortable on your journey. Furnished with a microwave, fridge, internal and external soundsystem, TV with DVD, Shower and toilet, LED lighting & outside shower. hob plates, oven, Just bring yourself and some food and you are good to go! An extendable annex/awning allows for creating your own private additional space - use this for indoor/outdoor dining or even an additional sleeping space. If you vechicle does not have electric brakes to tow this caravan we offer a portable brake unit for a additional cost. 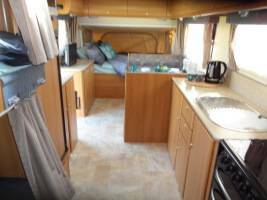 We would like our caravan returned in the condition that we hire it out to you. IE: cleaned/ tidy/ and everything as it was . Otherwise we feel the need to charge a service fee . plus review your bond (deposit) and the customer liable for any damages. The toilet MUST be empty and cleaned prior to returning or additional cost will incur. While abiding to the house rules PLEASE feel free to enjoy .!!!! We loved hiring the caravan, it was very clean and the perfect size for our family. It was great having the bigger fridge, airconditioning and an ensuite! The beds were were comfortable and the bunks were great for the kids. Plenty of storage and it was great that it also included all our kitchen needs with plates, cups, cutlery & more! We would highly recommend this van and would definitely do it again. Thanks so much for the great review, we are glad you had a great time away in our van. We were thrilled to have the van returned in such a sparkling clean manner, it was really appreciated. You can pick up the caravan in Saint Leonards at Paula Or Monique's place.